As soon as Elizabeth heard about prince Affonso's revolution and the impending civil war against the king Diniz, she set out from the hospital where she was staying to see if she could not bring peace between them. She rode the fastest horse she could find because the armies were marshaling against each other with bloodshed on their minds and there was little time left to retrieve peace from the grip of war. Her work at the hospital where she provided food to the hungry and medical care to the sick was put on hold as she rode off to stand between the two armies to insist upon peace. It seemed a fool's errand but if there was anybody who could bring reconciliation between Affonso and Diniz then it was Elizabeth. After all, she was the queen of Portugal and, thus, the wife of Diniz and the mother of Affonso. As a child she would never have guessed where her life would lead her but, then, none of us ever really do. When she was only a child in Aragon and her father told her that she would soon be marrying a man named Diniz who was the king of Portugal, she must have imagined what it would be like to be queen of Portugal instead of princess of Aragon but indubitably she never expected it to involve risking her life and life's work to negotiate peace between her own husband and son. Elizabeth married Diniz when she was only twelve years old but it was expedient for both Aragon and Portugal to make such a political move and so she entered into matrimony with a man she barely knew. Diniz was captivated with young Elizabeth as she grew and while still a teenager she gave birth to two children: the prince Affonso and the princess Constantia. But the appetites of Diniz went unchecked and he became an adulterer as was his supposed privilege as king. Elizabeth remained faithful to her unfaithful husband and continued to practice the loving faith instilled in her by her family and the Church she loved. While Diniz practiced debauchery, Elizabeth practiced charity and often secreted bread from the royal table to the beggars who waited in the streets for an act of mercy from the queen they loved and who loved them. She opened a hospital and a convent of "Poor Clares." 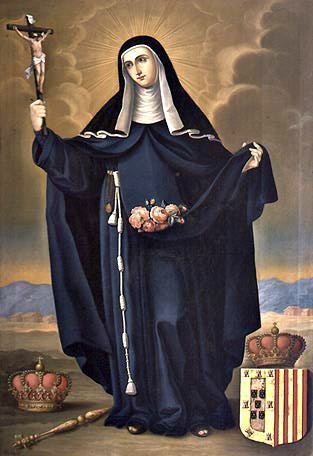 She would later become a member of this convent after the death of Diniz and before Affonso's second war against family but for years she was simply the founder and benefactor of this group that daily lifted up her and others in prayer. Though she was abused by Diniz for her devotion to her Lord Jesus she refused to turn aside from her commitments to love, faith, hope, mercy, and grace. Her life had been changed not by the royal positions she had attained but by the humble guidance of a crucified Lord. When she arrived at the field of battle she could see the blood lust creeping through the armies that had been fed steadily on a diet of both hatred and fear. The men who prepared to wage war stood to gain little in victory and lose everything in defeat but they could not escape the grim march that led to battle and so they prepared to take the lives of their brothers as they also prepared to offer up their own in sacrifice to royal ambitions.Once again it would be the lives of the poor that were the burnt offerings before the gods of war. Elizabeth placed her body and her life between the two armies and called to her husband and her son. Neither were willing to be the one who ended her life and so the three met together between the soldiers who were afraid to hope for peace because they knew all too well the ways of royalty. We don't know what she said but she was able to reconcile father and son to each other at the cost of being cast aside by her husband the king. She made a sacrifice so that others would not be forced to do so. Years down the road, she would be called away from the monastery of her devotion to negotiate peace again between Affonso and his son-in-law. She did so, again, but the exertion and stress cost Elizabeth her life. She died having made yet another sacrifice for her Lord and his Kingdom.